In the window you'll find a model of Rock Candy Mountain. Some of you may already know about the concept for it, it was featured in the D23 calendar for December 2010. In early 1957 Imagineers had envisioned this mountain to be located near the canal boats and have Casey Jr. train tracks travel around it. Trolley Treats will offer gourmet marshmallows, hand-pulled taffy, caramel apples, hand-dipped strawberries, toffee, fudge and more. You'll also be able to watch the Candy Makers at work! Will you be checking out Trolley Treats when it opens on June 15th? What's your favorite Disney confectionery treat? We'd love to know! Share your comments in the section below. 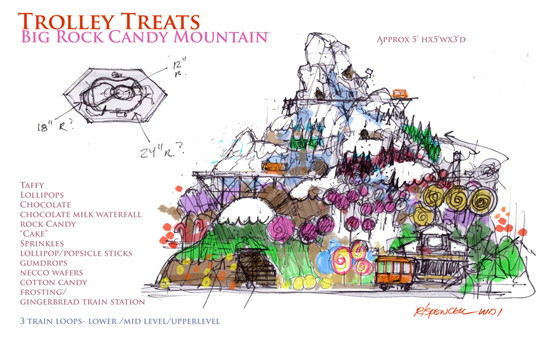 From the name Trolley Treats, I could imagine the diversity of the candies offered. It's disney, from that alone I can tell all of them would taste delicious for any kid.